They say it couldn’t happen here. But it did. 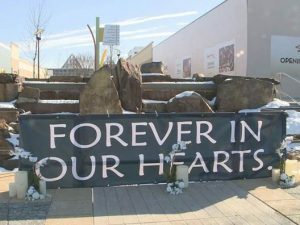 On Saturday, a young man shot and killed 2 employees of a mall store in Columbia, MD and then took his own life. Lately, places like movie theaters, shopping centers, and even our schools no longer seem like the “safe havens” we thought they once were. What’s even scarier to us in Baltimore is that it happened in our own backyard. When the Aurora and Sandy Hook shootings happened, as horrific as they were, they felt far removed. When the Perry Hall High School shooting occurred, while heart-rending, not having a child in a public high school seemed, to me, reassuring. But after Saturday’s tragedy, how do I reassure my “tween”, not to mention myself, that this random act of violence, in a place we often frequent, is in fact, a rare event. The other night my child woke me up at 5am because she had a bad dream. What was the dream about? She and some friends were together in a place and someone tried to come in and hurt them. What made her mind drift to such a scary dream? She heard about a tragic shooting in the news that, in this case, hit too close to home. Trying to shield the news from a middle schooler who is required to bring current event stories into class is not an option. So how do I calm my child’s fears and let her know she is safe? Listen carefully to your children talk about their fears. Reassure your children that these tragedies are rare and there are people like the police who are working to keep us safe. Talk to them about what they know and where they got the information from. If they are seeing it on the news, watch with them and answer any questions they may ask. Watch for signs of anxiety or stress and seek professional help if necessary. While the world we live in today has become a scary place and we, as parents, cannot control what happens, we can create safe and loving homes for our children. For more tips from a JCS therapist, also read In The Wake of Sandy Hook: Helping Our Broken Hearts by Debra Waranch, LCSW-C.